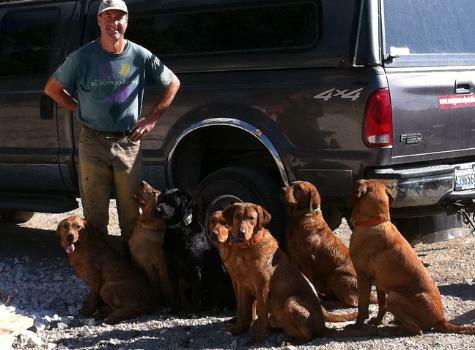 See what some of our happy owners have to say about their Morgan's Red Pointing Lab! I hope this note finds you and yours happy and healthy. I’m writing to thank you both as well and Lucy and Cowboy for Penny. Penny has challenged us and requires lots of attention, patience, and time as all youngsters do. As you know, we also have two young boys, who call Penny “Sis.” Sis is energetic and rambunctious but has always been loving, kind, and patient with us and the boys as well as our cat, who never wants to play with her. I’ve never seen Sis behave aggressively toward other animals or humans until this morning. As I straightened up the boys’ bedroom, I heard what sounded like a dog dying, Sis barking, and two dogs growling and snarling in our backyard. I peeked out the bedroom window to see Sis engaging an animal through our 6' tall chain link fence, but also intermittently patrolling the fence line. I ran downstairs and quickly put on my boots and raincoat and went outside. Sis was engaging a sickly looking black coyote through the fence because it was trying to attack her, and it was barking and snarling at her. Sis stood her ground; but, when she noticed I’d come out, she circled me, pointed at it, and heeled on my left. I hollered at the coyote; but, it didn’t seem scared and sauntered back off into the woods. I notified our local animal control, so hopefully they’ll locate it and put it out of its misery. You breed and raise amazing, intelligent, and strong dogs who love and protect their families as is evident by what Sis instinctively did for us today. I can’t thank you enough for trusting us to bring Sis into our family and raise her. Thanks, and thanks, and ever thanks. A quick update on Addy. She is doing wonderful. Recalls on command, sits, stays and heels. Goes into kennel/crate on command. Retrieving nicely. Even steady on the retrieve, meaning I can have her sit, throw the bumper and release her to retrieve. Has a very natural point. I Have shot my .22 pistol in training and zero affect. She also swims beautifully. Not much shakes this pup. She is fearless and loves the outdoors. Gotta get a handle on the puppy biting but know we will. Looks like you have your hands full again with pups. I know they'll be excellent dogs. Thanks for a wonderful Dog, she is a keeper. Jim and Andrea; I'll try to keep this short but I've got to brag. Last year my 8-month old Morgan female and I hunted pheasants in South Dakota. 2 friends, John and Ted, each saw my dog hunt and were so impressed that, when they got home, each ordered a Morgan's Lab. Now a year later, I sent my dog back to Kent Baxter, who trained her for 2 weeks last year. Kent called after one week and said he can't teach her anything more. She didn't lose anything she was taught last year and, in Kent's words "is brilliant". Staunch 25 yard points, quick as a spark, reliably retrieves to hand, works close and has a great nose. This is really an exceptional little dog. And sweet?? She'll steal your heart and she has mine. Thanks and all the very best to you, Tom. thumbs it would be a different story. She can't hold onto the rod...."
and also how to retrieve a ball because she does that too and drops it at our feet! (at 10 weeks old.) Thank you again! ps : you can use anything I've said as a reference on your web page if you'd like, I'm a believer! :-)"
has been a wonderful blessing to our family. I am so glad God brought her to me...soon after we got her I got very sick. It ended up to be M.S. Bella would stay by me all the time. She would bark to let me know when someone was at the door or what ever. She is sooooo loving and sweet. She loves to chase after the ball or bumper. She is an all around great family dog. This school year I am sending my son off to college, he is my last one. So I am so glad to have my Bella . That has been our life with Bella for the past almost four years. Thank you for breeding a wonderful dog." 2012 litter. Owned by John McKeever. ​"You probably won't remember me but I got a puppy from you 3 1/2 years ago. She was born in February and is out of Strawberry and Cowboy. There were only two females in the litter, you kept one and we got the other.... You may remember me because I live in Bellingham and was particularly worried about the "birdiness" of the puppies.... In any event, I wanted to touch base and give you an update. First, Ruby is an absolute gem as a family dog. Every night during the first two years, Ruby would lay at the foot of my daughter's bed as she would do her homework. Now that my daughter is a sophomore at Montana State, Ruby will still wander down the hallway to her room most evenings and lay on her bed. As a hunting dog, Ruby has been exceptional ever since her very first season when she was only 8-10 months old. How many puppies just know instinctively when looking for a crippled mallard hen in flooded cattails to start looking from the downwind side. Her marking ability on downed birds is also exceptional. My hunting buddies and me harvest approximately 250-300 ducks off my property each season and Ruby recovers almost all of them. This past September/October I shot 37 grouse with her, mostly blues and spruce. I know that some hunters might think you don't really need a good dog for blues/spruce but let me say that without her I might have gotten 10. Just the past weekend I was on a duck/goose hunt near Soap Lake. We went over a day early and hunted the Gloyd Seeps area the afternoon before the real hunt started the next day. My hunting buddy has a fox red lab he got out of a hunting lab breeder who broke off of Wild Rose Kennel. His dog is a very good dog but after 3 hours of hunting a public area on a Thursday afternoon his dog had put up no birds and was basically following him as we walked out back to the parking area. In contrast, Ruby had put up 3 roosters, the last of which was with 5 minutes of shooting time left 50 yards from the parking lot and she was still doing her zig zag pattern about 20 yards out in front of me. In short, if she is in the field she is hunting the whole time. The other thing I really like is Ruby doesn't wander off and is always aware of where I'm at. In the duck blind her head is always scanning the sky and when her head stops pivoting around we know ducks are in the air. In short (or not so short), I've had a number of good hunting labs over the last 50 years but Ruby is the best I've ever had or ever been around. Please stay in business for at least 6-8 more years because I will definitely come a knocking when Ruby retires. Thank you so much to you and Andrea for all that you do so we can have the absolute pleasure of having a dog like Ruby." "Grace is doing well. She continues to be an absolute joy....People actually stop me to tell me how well-behaved and beautiful she is. All I can reply is "I know!!!" ...."Copper is doing great and loves the outdoors with great enthusiasm. I know he actually smiles when he knows he's heading out on another adventure....We hope you enjoyed the pictures, we have a thousand of them!!!! " while he was still a pup, but he has certainly turned out extremely well. Like your other references, everybody comments on what a fantastic dog he is." 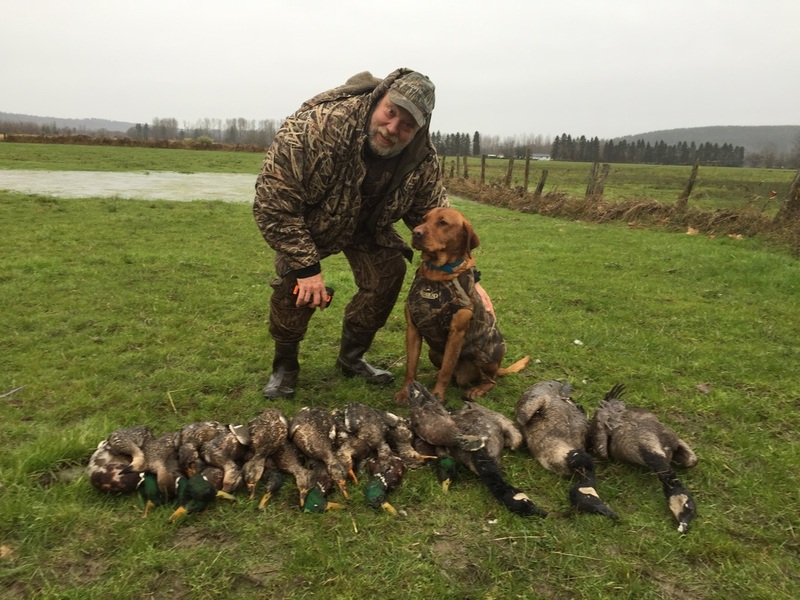 Labs but this pup is over the top on all issues...."
​"I thought you would appreciate an update and picture of Roxy's first hunting trip, since it seems many of your pups go to families that do not hunt. NOT our case and Roxy will get her share of hunting in, even this season. I did a quick afternoon dove hunt yesterday with Roxy and our older (almost 12 yo) lab. Not fast shooting but got a few, and more importantly, Roxy made her first retrieve and got to "see what it is all about". She is 5 months (from Dixie if you recall) and she's showing all the signs to be a good hunting dog. She marks well, uses her nose well, strong swimmer, and is focused (for a young dog) on birds and bumpers. She watches birds and isn't afraid of much at all. I'm looking forward to our continuing training and hunting season! Hope all is well with you two. Good luck with your bird season too!"